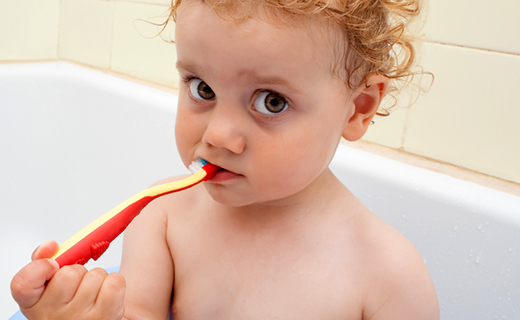 Baby teeth eventually fall out, so why should you go to great lengths to care for them? The fact is that unhealthy primary teeth can lead to problems such as spacing issues or decay of adult teeth. Additionally, seeing an affordable dentist regularly in childhood helps prevent dental phobias, and adopting a good dental care routine while young ensures a lifetime of good habits. Staying on top of your children’s dental care is critical if you want their visits with the dentist to be affordable, twice-yearly check-ups rather than frequent visits for costly procedures. Teeth typically erupt in pairs, and the first teeth to break through the gums are usually the lower central incisors, which appear around the age of six months. Over the next two years or so, all of your child’s baby teeth will fully erupt. Around kindergarten or first grade, your child’s primary teeth will start to loosen and fall out, and tooth loss usually occurs in the same order as the teeth erupted, beginning with the bottom central incisors around age 6 and ending with the second molars around age 12. You’ll notice that the underlying permanent tooth is often already breaking through the gums when the primary tooth is lost. For a few years, your child will resemble a jack-o-lantern, sporting a combination of spaces, small baby teeth, and large adult teeth. By age 12, all permanent teeth should be in place. In addition to giving your child a good cosmetic appearance and helping him or her eat a varied, healthy diet, baby teeth help in developing good speech patterns. Primary teeth additionally serve as placeholders for the adult teeth. If a baby tooth is lost because of decay or injury, it can throw off the spacing of the surrounding teeth, which can block the eruption of some permanent teeth or cause them to come in crowded or crooked. Decayed baby teeth can also lead to damage of the adult teeth beneath them before they even have a chance to erupt. Diligent dental care at home and regular dental visits can set your child on the right path so that he or she can avoid the discomfort and anxiety often associated with extensive dental procedures. To maximize your children’s chances of having healthy teeth for life, schedule dental appointments with an affordable dentist in Virginia as soon as possible.